As I promised, I’m getting back to creating some FREE Baby Book pages for your very own DIY Baby Book! 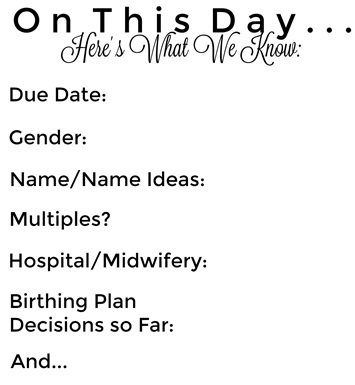 Today’s printable page is a “What We Know” page, created for you to fill in any information you know about your baby and pregnancy! It would make a great first page in your book so that you can record all of the information you know on the day you begin making your baby book. The great thing about it, is you can also insert the page multiple times throughout your baby book! For example, you can insert this page every month so that you can update all of the information you learn throughout the weeks. As you can see, this page is rather simple. This means it can go with any theme you pick for your baby book, and that there is lots of room to decorate if you wish. As for filling in the information, do it however you wish! Answer with a “Yes” or a “No”, answer with the details you know, or both! At the end “And…”, fill in any additional information you’d like to add! I hope you enjoy this page if you use it! If you ever have a recommendation for a page or would like to request a personalized page just for you, please don’t hesitate to say so! Leave a comment here, or contact me on instagram @beingmrsparry and I will be happy to create what you ask for! I love creating personalized items for people, so you would be doing me a favor! Thank you for visiting Being Mrs. Parry. If you are using these printable baby book pages as a part of your DIY baby book, please share it with me! I would love to see how they are used to record your precious memories! Download today’s free printable page below!